Modern technologies (e.g., tablet, smartphone, large public displays) remove many of the constraints that define the scope of what television is or can be, but we often define it based upon our prior TV experiences with broadcast and cable television. This one-day workshop at TVX 2015 will address design challenges and opportunities (e.g., of video streams, social TV apps, second screens) in order to consolidate existing knowledge to describe the changing landscape of TV experiences. It's time to redefine what we think of when we say "television," and this workshop will engage participants in that process. Dandavate, I. (Isha), Milam, J. (Jennifer), Allen, J. (Jeanne), Moser, C. (Christiane), Kargl, T. (Thomas), Tscheligi, M. (Manfred), … Negenman, J. (Joost). (2015). 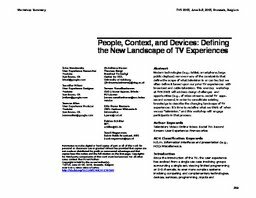 People, context, and devices: Defining the new landscape of TV experiences.